Preheat oven to 300 degrees. Diagonally slice sweet potato, with skin, thinly into chips. Toss with 3 tablespoons olive oil, 2 teaspoons sea salt, 1 teaspoon cracked black pepper, and 1 teaspoon cayenne (or to taste). Place on baking sheet and sprinkle with dried basil. Cook for 20 minutes; turn over each slice. Continue to cook until slices become thin and crunchy (at the end they will be cooking with nuts in oven). Meanwhile, add celery and carrots to 2 tablespoons olive oil in large pot on medium heat. Cook 10 to 15 minutes or until softened. Add garlic and onion and lower heat. Cook for an additional 15 minutes. Add 1 teaspoon cracked black pepper and 1 teaspoon sea salt, stirring occasionally. After vegetables are lightly browned, add 3 cups water and stock to pot. Add rinsed peas to pot, stir and cover with lid slightly tilted. Cook for 20 to 25 minutes, checking occasionally and stirring if needed. Over low heat in large saucepan, slowly cook sweet onions with remaining 1 tablespoon olive oil, a little salt, and white pepper, stirring occasionally. Arrange salami in a separate saucepan over low heat and cook for 5 to 7 minutes. Flip and cook for another 2 to 3 minutes. Remove and let cool (they crisp as they cool). Gently toss citrus fruit slices with arugula and hazelnut oil. Sprinkle with sea salt and torn fresh mint leaves. To plate, spread split peas, top with caramelized onions, then top with citrus and arugula salad and a sprinkling of Spiced Nuts. 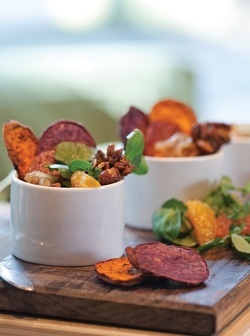 Garnish with a few slices of sweet potato crisps with crisped salami. After sweet potatoes have been baking for 20 minutes, reduce oven temperature to 250 degrees (leave potatoes in oven). Spray baking sheet with canola cooking spray and set aside. In large bowl, whisk egg whites until frothy. Add nuts and stir until coated. In small bowl, combine sugar, curry powder, cumin, garlic salt, cayenne, cardamom, and cinnamon. Sprinkle mixture over nuts and toss until coated. Spread nuts on baking sheet. Bake for 45 minutes or until golden and fragrant, stirring occasionally.